Above: Fleeing the murderous night raids by the LRA, who target children for abduction - boys to swell their fighting ranks and girls to be slaves and 'wives'. 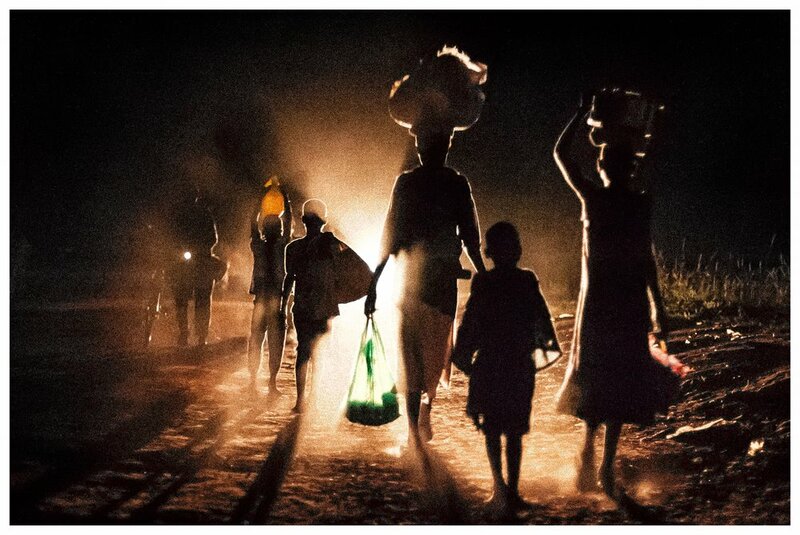 Each evening whole communities known as night walkers leave their villages and head for the relative safety of larger towns and night camps. There is little food and no work in these temporary refuges so families return to their fields and villages each morning. Below: Children sleep rough wherever they can find shelter. At the peak of the conflict it was estimated that up to 60,000 children were sleeping on the streets in local towns. Early in the morning on the outskirts of town, a bright young girl comforts her sibling as they prepare to move back to their village.